US intelligence intercepted discussions among Saudi officials to capture journalist Jamal Khashoggi, who recently disappeared and is feared to be dead, The Washington Post reported. Khashoggi disappeared last week after entering the Saudi consulate in Istanbul. Turkish officials believe Khashoggi was likely killed inside the consulate. US intelligence intercepted discussions among Saudi officials to capture journalist Jamal Khashoggi, who recently disappeared and is feared murdered, The Washington Post reported. The discussions, which were relayed to The Post via a person familiar with the information, occurred before Khashoggi disappeared. The officials reportedly wanted to “lure” Khashoggi back to Saudi Arabia – his native country – and “lay hands on him there,” the person told The Post. The Post said it’s not clear what the officials were planning after the capture. It’s also unclear if US intelligence warned him in any way. Ned Price, a former NSC official under President Barack Obama, wondered whether the intelligence community violated a directive that says it has a “duty” to warn potential victims of impending threats. A spokesperson for the White House National Security Council declined to comment. But State Department spokesman Robert Palladino on Wednesday afternoon rejected the notion the US government had any prior knowledge of a plot to capture or harm Khashoggi. 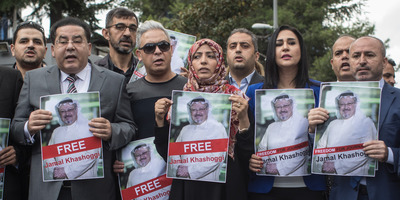 “Although I cannot comment on intelligence matters, I can say definitively the United states had no advanced knowledge of Jamal Khashoggi’s disappearance,” Palladino told reporters. Khashoggi disappeared earlier this month after entering the Saudi consulate in Istanbul to obtain documents to marry his Turkish fiancée, who waited outside. His fiancée, Hatice Cengiz, said she waited for roughly 11 hours, but he never came out. Turkish officials have since said they believe Khashoggi was killed inside the consulate by a 15-man team sent to Istanbul via private jets under orders from the “highest levels” of the government. They have said the team killed Khashoggi, dismembered his body with a bone saw, placed it in boxes, and transported it back to Saudi Arabia. Saudi Arabia has vehemently denies the allegations and claimed Khashoggi left the consulate. Video footage shows Khashoggi entering the consulate, but there’s no evidence he left. Some footage from the consulate has mysteriously vanished, according to Turkish authorities. Khashoggi has often been critical of the Saudi government in his reporting. He was once closely linked to the royal family, but left the country amid Crown Prince Mohammed bin Salman’s efforts to consolidate power. The prince has arrested prominent Saudis, including friends of Khashoggi. Since leaving Saudi Arabia, Khashoggi has written for The Washington Post. The paper has expressed deep concern over his well-being since his disappearance.